Love this - The charity Help Refugees is opening a pop-up shop to raise money for refugees, with products curated around the refugees' experience - Arrival, Shelter and The Future. It's open from 24th November 2017 to 31st January 2018 at 18 Broadwick Street, Soho (the Berwick Street end). To be totally clear, you can't buy these for yourself, but you donate to the refugees. It's a bit like a physical pop-up manifestation of the 'gift a goat' ads in the newspapers. Please support them! 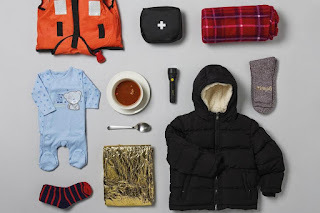 "In an effort to free us all from the grips of consumerism this Christmas, UK charity Help Refugees and creative collective Glimpse are teaming up to open Choose Love, the world's first pop-up shop where you can buy tangible gifts for refugees. The Soho store will give Londoners the opportunity to buy all sorts while also learning about the challenges of the refugee crisis across Europe and other parts of the world. Everything on sale is themed around the three phrases of a refugee's experience: Arrival, Shelter and the Future. Items include all sorts from nappies to socks, blankets to sanitary towels and medical equipment, with prices starting as low as £4.99. Choose Love is open seven days a week from November 24 to January 31 2018 at 18 Broadwick Street, W1F 8HS"